Choose peaches, nectarines, apricots pineapple and bananas that are not too ripe. Grill big pieces – cut stone fruit in half & remove pit, pineapple in 1inch rings and bananas lengthwise in half. Brush the fruit lightly with a mild, fruity extra virgin olive oil or citrus oil like the blood orange. Don’t use too much or the fruit will be greasy tasting! 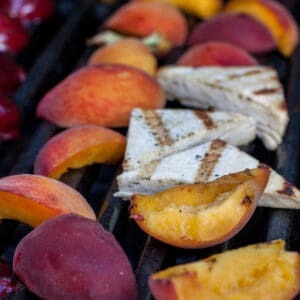 You can sprinkle some Peach, Pineapple or Coconut White Balsamic Vinegar on the fruit just before grilling if you like to get a little caramelization – just watch the flames. And before you start, make sure your grates are clean and rubbed with a little oil to help keep the fruit from sticking. Enjoy with a little whipped cream, ice cream or my favorite – small scoops of sherbet or sorbet like coconut, mango or orange!